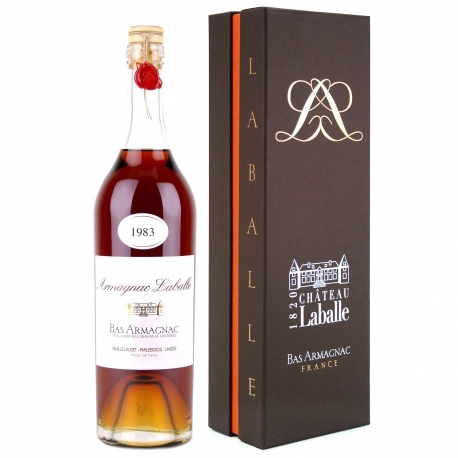 - 2015 General agricultural contest of Paris, "Compte 20 ou plus" category : Gold medal for his "21 ans d’âge"
For nearly two centuries, Château Laballe Armagnacs have been produced by the Laudet family according to the ancestral tradition. From the management of the vineyard to the aging process, everything is put in place to extract the maximum specific qualities of this rare ground. The vines are cared for and the earth is worked in order to bring out the iron oxide (the main characteristic of the Sables Fauves) which brings refinement and roundness that is specific to the Domaine. The distillation and the aging process are done following standards that were put into place over years of experience. The barrels are placed in the astounding Armagnac storehouse of the chateau where numerous elements come together to create the ideal conditions to make grand spirits.